What if there was a mental exercise you could do that would increase your brain size, make your thinking more efficient, reduce your anxiety levels, increase your productivity and help your body remain younger, longer? With these kinds of claims, if this was a product, we’d all be buying it, but because it’s an activity, there aren’t that many people who are willing to give it a go. Meditation is not new but we are beginning to use new scientific techniques like functional magnetic resonance imaging (fMRI for short) to help us peer deep into the brain while it is meditating, and what we are seeing is actually pretty amazing. The mind treats thoughts and concepts that it visualizes as real. As a result, attaining a state of inner calmness through a little concentration and some controlled breathing affects the immune system and the genes that have an impact on both the quality of life we can enjoy and how long we actually live. The reason the brain can achieve such incredible improvements in attention, productivity, memory and overall performance lies in the way information flows through it. The neurons of the brain are constantly firing, apparently, but a lot of that firing is random noise. By sending a signal inside our heads that has to go from “A” to “B” we are also creating a lot of useless, random noise. We only ever perceive something, learn a new thing, remember an event or perform some action when there is information flowing through the brain’s connections that we can actually act upon. Meditation optimizes the way the brain handles information making it generally more efficient and it even contributes to an increase in gray matter in the frontal lobes where all the higher brain functions take place. The best way to view meditation then is as a form of exercise for the brain, enabling it to improve significantly on its everyday performance, much like physical exercise optimizes and improves the way the body works. Contrary to popular belief you do not need be sitting in the lotus position under a tree in order to meditate. You could sit in your favorite sofa or armchair, or anywhere you consider comfortable. Nor do you need to spend hours and hours. As a matter of fact it is almost certain that in the beginning you will be hard pushed to meditate for even 10 minutes. Provided you’re ready to try your hand at it you now need to know how. 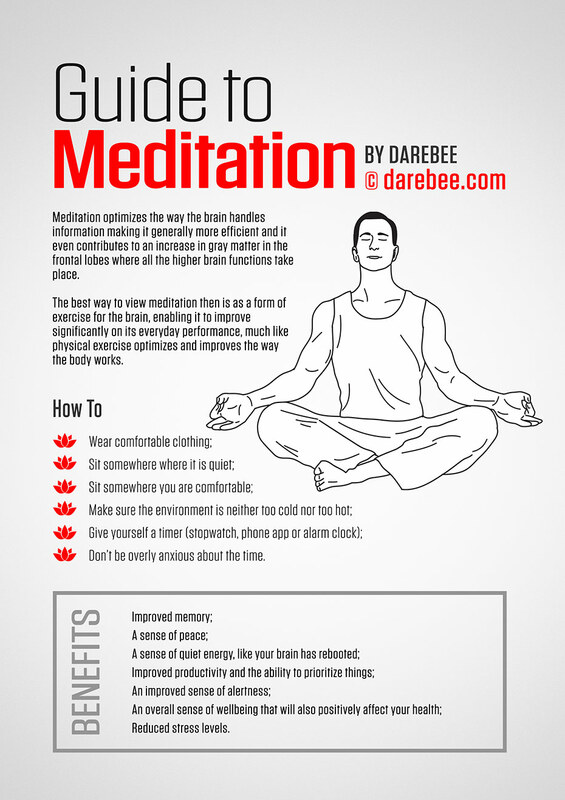 There are two basic meditation techniques. One requires you to focus on nothing (which is really hard to do), emptying your mind of all distractions and allowing your thoughts to unfold, unbidden. It is popularly known as the no-mind technique. The other asks you to focus on a particular thought to the exclusion of all others. This is also known as mindful meditation or focused attention. Both forms of meditation will require you to focus on your breathing. By becoming aware of how your lungs work and how each breath enters your body, the rhythm of it and the sensation it produces you begin to see a process of thinking that you can control. but that is just the mental scaffolding required in order to build the much more focused mental practice of thinking of nothing (if you choose to use the empty-mind form of meditation) or thinking of something. The timer is just an aid to help you not worry about the amount of time that’s elapsed, in the early stages. It also creates clear start and end boundaries for your meditation. Initially set it for ten or fifteen minutes. Once you have done all that, you can begin. The first question those who are new to meditation ask is should their eyes be open or closed. It really doesn’t matter but for beginners it is always easier if they are closed because it makes it easier to focus. Experienced meditators can switch their mental state between meditating and being normally engaged in everyday life even with their eyes open. Now, start breathing evenly. Take deep breaths through the nose and then slowly let them out through the mouth. Do not rush. Let your body flow into an easy rhythm of breathing in and out without forcing it to. If you’ve decided to try the no-mind technique the next step is probably the hardest: close your eyes and empty your mind. The moment someone tells you to clear your mind it becomes almost impossible to obey. Thoughts rush unbidden in their dozens and hundreds, sometimes, through the mind. The trick here is not to resist. Let the thoughts flow and discard them. Focus instead on your breathing. Without pushing your mind, let it hold your breathing in and out at its very center. As thoughts come then they will usually also go, until all you have inside your head is a sensation of darkness and peace. This is the no-mind stage. You are lightly aware of everything but because nothing in particular holds your attention beyond your breathing you are also aware of nothing. If you decided to try focused attention as your meditating state your task, in the beginning at least, will be easier. Mindful meditation asks you to focus on a particular thought or idea. It could be “world peace” for instance. Or the thought that “the color blue is so calming”, or your favorite mantra (if you have one). If you don’t have a mantra but would like to use one choose a pithy phrase like “Float in darkness” or “Peace and harmony”. You hold that in your mind and say it again and again, keeping time with your breathing. The brain is a wild, undisciplined instrument and it will try to distract you. It is important to acknowledge the thoughts that come up and then discard them, returning to the thought you are focusing on, to the exclusion of all else. When we are so focused on fitness for the body it is only right that we can bring the same level of fitness focus on the mind.